Austin Meadows caught fire last week, collecting 10 hits with four homers over a dominant three-game stretch. Welcome back to week three of the Risers/Fallers series. By now, you know the deal. I cover players who have been on fire and, on the flip side, discuss players who have been ice cold. I’ll dig deep to figure out if the underlying metrics match each player’s performance and give advice on how to handle them going forward. Since we are entering our third full week, sample sizes are getting larger, so we can start making more concrete decisions. Keep in mind, I’ll stay away from players on the injury list in the Fallers sections. Meadows hit a blistering .545 (12-for-22) with four home runs, 12 RBIs, and a stolen base last week. His production, while unsustainable, does not appear to be a fluke. He walked more frequently than he struck out last week, and his batted-ball profile is a thing of beauty. His hard contact via FanGraphs is 47.6%, and he’s hitting fly balls 42.9% of the time. His barrel rate (BRL%) is 17.9%, nearly triple his 6.4 BRL% from 2018. Not to throw some cold water on his early season success, but his contact rates are slightly below-average. That said, his increased patience should provide solid walk rates atop Tampa Bay’s lineup. I’m buying Meadows as a post-hype sleeper who may finally be breaking out because prospect growth is not linear. After going the entire first week without a hit, Winker went 7-for-18 with four home runs, seven runs, and eight RBIs this past week. After an atypical seven strikeouts to one walk through 10 games, he improved closer to past norms with three walks and strikeouts each in last week’s five games. The season-to-date numbers (.211/.286/.526) still aren’t great, but Winker’s .383 expected wOBA tells me he deserves much better results. I predicted close to 20 homers this offseason, and I actually believe he could surpass those numbers. His ground-ball rate is down to 37.5% and the juiced ball appears to be back. Winker will provide solid batting average, power, and a ton of runs atop the Reds lineup. If he’s available on the wire, go grab him. After Marquez nearly no-hit the San Francisco Giants in a complete-game, one-hit shutout, the haters may need to take a step back. I understand the Giants are a poor offensive club and Oracle Park is an extreme pitcher’s park, but Sunday’s performance was anything but ordinary. Marquez is just 24 years old and has learned how to pitch over the past calendar year. He’s averaging 96 mph on his fastball and has developed a nearly unhittable slider to pair with a great curveball. 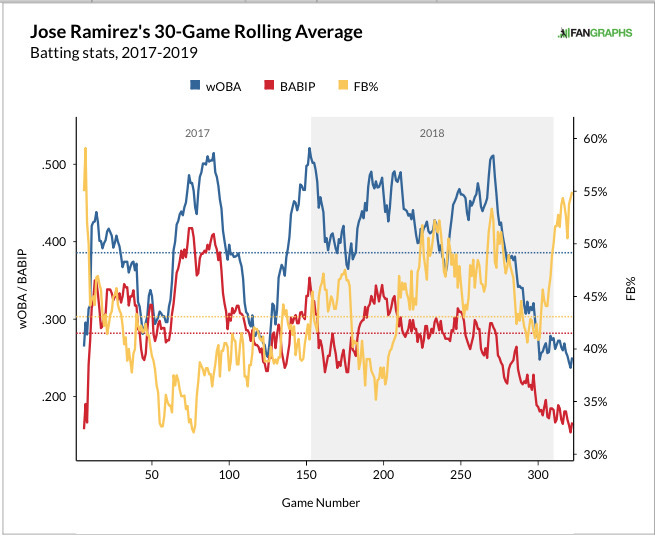 There will be some rough starts at home for Marquez, but I believe he’ll perform better than the .369 BABIP and 21.3% HR/FB he allowed in Coors last year. Owners have to accept a likely 4.00 ERA at home, but that’s more than passable with elite strikeout numbers and likely a sub-3.00 ERA on the road. I’m a believer in Marquez, who has a great chance to finish inside the top 20 for starting pitchers in 2019. When the Phillies signed David Robertson, it was assumed he would take over the closer’s role with Seranthony Dominguez as his setup man. Neris was an afterthought. Neris possesses a nasty splitter that has helped him induce a swinging-strike rate of 19.1% last season. He has not allowed a single hit on 68 thrown this season and has struck out over 40% of batters on the pitch since the start of 2018. Unfortunately, Gabe Kapler will likely play matchups for save opportunities, but the Phillies should win a bunch of games. Neris, who was free on draft day, could fall into 15 to 20 saves this year with an elite strikeout rate. Few hitters in baseball are as ice cold as Jose Ramirez. This past week, he batted 2-for-26 with just one run. Now in his second straight slow start in consecutive seasons, should owners actually be concerned? Well, there are a few differences. The fact that he hasn’t drawn a walk in over a week with seven strikeouts in his last 27 plate appearances is very unlike his approach. This is a guy who walked more than he struck out last season. In addition to his decreased plate discipline, his batted-ball profile has gone to the extreme in terms of launch angle. Based on his 30-game rolling average, his wOBA and BABIP are at the lowest they have been in over a year. The increase in fly balls is hurting his production when he’s not hitting home runs. He needs to stop trying to beat the shift and tone down his extreme fly-ball approach. To be fair, his BABIP is an unsustainable .222 on line drives, and Baseball Savant has his expected wOBA (.264) nearly 100 points higher than his current .167 wOBA. Better times are coming, but given the poor surrounding cast, I have a difficult time envisioning Ramirez finishing with first-round value. Pollock hit just .200 (5-for-25) with zero home runs or steals and just two RBIs this past week. He’s only totaled one homer and hasn’t stolen a base this season. Last year, like many players, Pollock modified his approach to elevate the ball more and hit for more power. However, in terms of his batted-ball profile, his hard contact rates are down and he’s hit more balls on the ground early this season. In terms of speed, Pollock is now on the wrong side of 30, so his days of 20+ steals are likely over. His approach change will keep his BABIP lower and thus generate a deflated batting average. Another concern is playing time. Pollock’s injury history is not pretty, and with the emergence of Alex Verdugo and the versatility of Chris Taylor, Pollock could see the bench once or twice per week. I’m not jumping ship, but 15/10 is a lot less appealing than 20/15. After striking out 10 Rays in his second start, Freeland has given up 10 runs, 18 hits, and five walks in his last two turns. Last season, he was able to succeed by suppressing BABIP and allowing few home runs. I don’t see a whole lot in terms of his skills eroding or change in his pitch mix. Coors Field allows BABIPs nearly 20 points higher than other stadiums and, of course, inflates home run rates. If Freeland simply regresses to the mean, he’s a pitcher with a 4.00 ERA and a below-average strikeout rate. The other issue is his 10.1% walk rate, which is not completely out of line considering his career 8.8% rate. As the BABIP and home runs rise, the walks will come back to bite him more often. We’ve seen it happen in his last two outings. I was not high on Freeland coming into the season, but he’ll fall a bit in my next rankings update.